COOK GROUND BEEF, ONIONS, AND PEPPERS. DRAIN. MIX WATER AND KETCHUP, AND ADD TO THE MEAT MIXTURE. 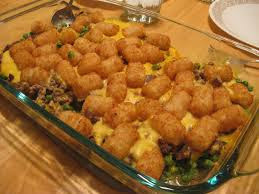 IN A 9 X 13 CASSEROLE DISH, PLACE ½ OF THE TOTS ON THE BOTTOM. TOP WITH MEAT MIXTURE, AND ADD ¼ OF THE CHEESE. ADD THE REST OF THE TOTS, AND TOP WITH REMAINING CHEESE.